Josh Taylor has said he wants to fulfil a lifelong dream and bring the biggest boxing match Scotland has ever seen to Edinburgh Castle Esplanade in a show that would be “one for the history books”. 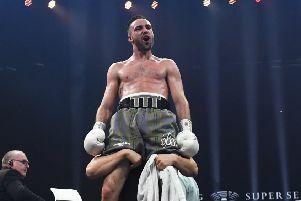 A sell-out crowd at the SSE Hydro saw the Prestonpans puncher overcome former world champion Viktor Potol on points after 12 gruelling rounds in a fight which now sets the 27-year-old Scotsman up for a tilt at the world title. It was the Scot’s toughest test to date but he looked in full confidence after brushing the Ukrainian aside. Current WBC super lightweight champion Jose Ramirez is now almost certain to be Taylor’s opponent for his first match on the world stage, with manager Barry McGuigan preferring the east coast of America for a showdown . Former Olympian and Commonwealth Games gold medallist Taylor, 27, said he would love to beat the Californian in his own country and then set up a defence of his title in front of thousands at Edinburgh Castle in what would be historic occasion in front of around 8800 live fans and a TV audience of millions more. Speaking in the wake of his victory on Saturday night, the fighter dubbed the Tartan Tornado, said: “I’d like to go over there [America], challenge him in his back garden and win it, bring it back to Scotland and fight at Edinburgh Castle”. Manager Barry McGuigan joked. “There’s every likelihood that it could happen if someone could speak to God and organise good weather. We’ll have to wait and see. There’ll be negotiations and bear in mind Ramirez is a top-ranked fighter. Fears that Taylor could have suffered concussion were raised in the aftermath of Saturday night’s fight after images of his post-match interview showed his right pupil highly dilated compared to his left. Several commentators on social media pointed out the anomaly as a sign of potential head trauma and urged the boxer to seek immediate medical attention. But the boxer’s trainer, Shane McGuigan, moved to reassure fans that the issue had been caused by some adrenaline on a swab which had been used to staunch a cut above his eye late on in the fight which had then dripped in to his eye.